Select one of the four quality rooms of Anna's Studios for your stay. Anna's studios for rent offer four different rooms with air-condition, free WiFi and a balcony. The studios lie within 30 m from the beach and a short walk from Lenta's restaurants, bars and mini markets. 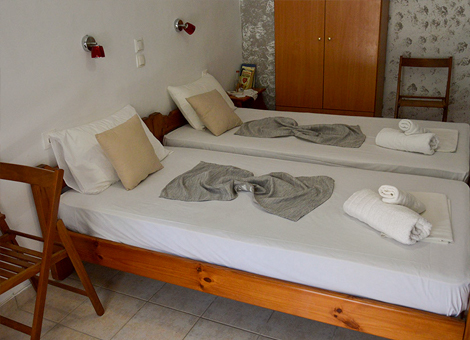 Αll studios and rooms have a kitchenette with fridge, cooking hobs, coffee maker and electric kettle. Studio 1: Inspired by the blue of the sea, studio Galene, is big and comfortable, suitable to accommodate up to 3 guests. Studio 2: Thalia is a small and cosy studio with earthly colors and traditional style, suitable to accommodate up to 2 persons. Studio 3: Suitable for romantic guests, studio Afrodite, is big and sunny, has its own balcony and is suitable to accommodate up to 2 guests. Studio 4: Studio Dafne is modern and elegant with beautiful earhtly colors, private balcony and unique style. It is suitable to accommodate up to 2 guests.